Now That’s High Assurance And Peace Of Mind! For a healthy body, one also needs a healthy mouth or oral health. And gum disease is a significant oral health hazard. For tooth loss in adults, gum disease is the leading cause in the United States. It not only severely impacts one’s mouth it also complicates other serious health conditions. Gum disease, when severe, is known as periodontal disease and is an active and escalating infection in your mouth. The infection results from a build-up of bacteria, which, if not treated, can devastate your tooth and lead to bone loss. If you lose your jawbone, it does regrow on its own. Periodontal disease is most active in your mouth and can extend in scope to other parts of your body—worsening systemic health conditions such as heart disease, diabetes, pancreatic cancer, and osteoporosis. Take Charge Of Your Oral Health And Check Yourself In For Periodontal Disease Treatment. What Happens In Periodontal Surgery? The traditional method for curing moderate to advanced gum disease is periodontal or osseous surgery. It’s usually carried out after other dental procedures such as root planning and scaling have been attempted. Periodontal surgery is also known as pocket depth reduction surgery. During this operation, the depth of the ‘pockets’ between the gums and the teeth is reduced to create a clean environment around the teeth. Plaque and tartar are removed from the teeth and from under the gums. The area is smoothed to get rid of remaining calculus. 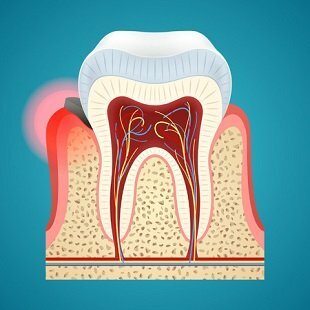 Now that the tooth roots are cleaned of the damaging bacteria, which caused gum disease, the extra gum tissue is taken out and stitching done to hold the gums in the proper position during healing. And voila, you get back your fulsome, healthy smile! Patients are advised to get tissue grafts to prevent further gum recession and loss of bone. The grafting can sometimes be used to cover sensitive or exposed root surfaces. We do this procedure in our San Diego office, and usually, the recovery time is short. A serious consequence of advanced periodontal disease is the formation of deep pockets between your teeth and gums. Often, they can’t be treated with regular non-surgical therapy. It’s at this point that the doctor may suggest a surgical procedure. But the more a patient waits to treat deep periodontal disease, the more bacteria increases inside the resistant pockets. At our clinic, we feel it’s more efficient to begin with non-surgical treatment, and after six months to a year, decide on the areas that require surgical treatment. It’s imperative not to allow worsening of bone loss in patients as it increases the treatment time. In pocket elimination surgery, the gum tissue is folded back, and the affected tissue is taken out along with the accompanying bacteria. The tissue is then placed back at a new level to allow patients to keep the area hygienic after the procedure. The visible result of surgery is improved oral health environment, which lets you clean and maintain your teeth properly. This prevents further damage and significantly increases the chances of retaining your natural teeth in the long-term. If your tooth is broken below or near the gum line or broken, there’s a possibility that there’s not sufficient tooth structure to restore your tooth. If the doctor decides that a long-term prognosis is in order, he will suggest a crown-lengthening procedure. During this surgical procedure, the level of the gum and bone are adjusted properly, exposing more teeth—allowing the doctor to restore your tooth to its normal functionality and form.